Have mercy, climate change. Scientific American reports that according to a study published this week in Science Advances, at least 60 percent of wild coffee species are considered “threatened,” due to “deforestation, climate change and the proliferation of pests and fungal pathogens.” The study explains that global coffee production depends on these wild coffee species, which are critical for crossbreeding certain traits into commercial coffee crops. Aaron Davis, the study’s lead author and head of coffee research at England’s Royal Botanic Gardens, Kew, tells CNN, “With so much deforestation going on around the world, wild coffee species are being impacted at an alarming rate.” Coffee species are apparently notoriously picky about how and where they grow, so that increased temperatures wrought by climate change or a difference in rainfall “can make coffee impossible to grow in places the plants once thrived.” Out of 124 wild coffee species, 75 are now at risk of extinction, and only half of those are preserved into germoplasm banks. Before you start stockpiling bags of beans, CNN reports that some areas, like Ethiopia, are creating protected areas to to save wild arabica coffee. But others, like Madagascar and Tanzania, are still at risk. USA Today points out that researchers report that there are several species that haven’t been seen in the wild, or in cultivation, for over 100 years. For coffee addicts, this may be among the most devastating climate-change news yet. 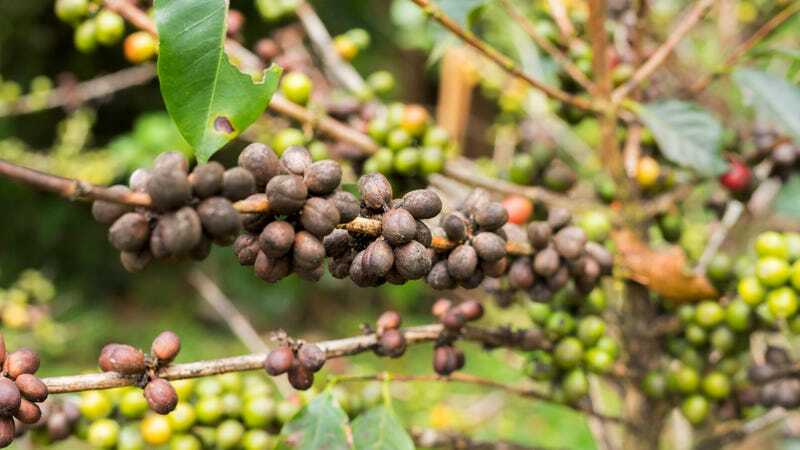 Fortunately, SA says that an organization called World Coffee Research (in partnership with the Global Crop Diversity Trust) is working on raising $25 million to develop a pool of coffee germplasms, to preserve some of these coffee species for the long term.